This post is the second in a four-part series. Please read The veil of perception first. To deepen our understanding of reality, we need to examine the building blocks that constitute our idea of it. Concepts are the way in which we define the world to ourselves and others, and these little cognitive units of meaning are what makes knowledge and reason possible. To understand them is to understand our thinking, and that is essential to our inquiry into the truth. Concepts are units of knowledge associated with a corresponding representation in language or some other symbolism such as mathematics or logic. They are words we attach to meaning, and the meaning to which they refer is derived from direct perception and experiences. Concepts are what enable us to reason, think, and communicate, and when combining them we can imagine things that do not exist at all. Unicorns is nowhere to be found in the world, yet we can envisage them by combining concepts already abstracted from experience such as colors, shape and form. We cannot communicate experience directly. It cannot be transferred to another person for re-viewing. If we want to share it with others we need to give them a symbol, a word, to then interpret in relation to what they are already familiar with: their own perceptions and experiences. The concept is what reminds us of knowledge that we already have. We create a concept by assigning a word for a particular perception or experience. As a child we are told the names of things by our parents. We learn by associating the name to the thing and hence an empirical concept is formed. Eventually our vocabulary and understanding is mature enough to learn higher-order abstractions: concepts that contain other concepts. A concept generally has empirical content, pointing to a direct experience or perception, but a higher order concept is a further abstraction, instead referring to another concept. We can illustrate this using the word “number”. The number three can symbolize any group of objects with three members: three elephants, three cars or three apples. This can be shown directly in experience; you can point to the apples and say “three”. A variable however, is a higher order concept and can symbolize any number but only has empirical content indirectly. Explaining the variable won’t do any good unless your friend first has a solid understanding of the concept “number”. Another example is the word “Society” which can symbolize any group of people, but has without the concepts “group” and “people” by itself no empirical content. But no matter how complex a concept you create, how high the abstraction runs, its whole pyramidal structure rests on a base of direct experience. The higher-order concept cannot refer to anything empirically different then the total content of the perceptions from which the concepts it relies on were derived. In short, all concepts ultimately point to direct experience and nothing else. The entirety of human knowledge – all science, logic and mathematics, all language and common sense – can have no more content than is contained in the sum of the perceptions from which the concepts that constitute this knowledge were formed. And thus, the perceptions and experiences from which these concepts are drawn are the real content of our thinking. All mental representation will always be limited in the sense that we cannot form an idea of something that was not previously experienced. Yes, you can imagine objects like unicorns and black rainbows even though you never seen those, but those representations are formed by combining other concrete concepts like colors, shape and form – all which are derived from experience. Imagining a four-dimensional hypercube is impossible, for we have not and cannot come in contact with such a creation. 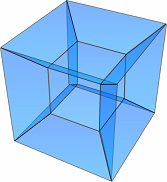 However, we could imagine a two- or three-dimensional representation of that cube. This will not be a real hypercube but a representation we can conceive. But like the unicorn, it is composed of concrete experiences like colors and lines. The image to the right is in fact a two-dimensional projection of a three-dimensional representation of a four-dimensional hypercube. We cannot represent something to ourselves that has never been perceived. The word red has no meaning to a person born blind. A deaf person cannot understand the word melody other than in concepts known to him, such as “something non-deaf people experience”, and no matter how well-explained by others, “Melody” will remain an empty word to him. Conception in terms of unperceived experience is impossible for the simple reason that we haven’t experienced such terms. Our understanding of the world is in the medium of concepts. They are derived from phenomena on the veil of perception and therefore, the real content of our thinking is in terms of the experiences and perceptions appearing on it. Thus, there are no objective concepts at all. Concepts are entirely subjective – they are always referring to our direct experience. This is the second article of a four part series. Please continue to read here. so concepts are built upon direct experience through our senses. Further enhanced by how we think through our thoughts upon any experience with the use of concepts. This then adds the dimension of abstracting and sophistication of out experience. We take our experience as Reality, but it is only a perception through our senses of a representation of what we call the outside world interpreted through concepts. This builds up and is what conditions us to view everything through more and more filters. This gives everyone a different way of experiencing what we call life. Hence leading to conflicts and separation. The big ? is how this merry go round came into appearance in the first place? We can know that we know without knowing what the knower actually is without using abstract concepts, so hence we the creator of this smoke and mirrors but the why is only thought about with concepts. The Hindus called this Maya, which again is only a word which is a abstract concept. Would like here from others with what they think. I also like to play with looking into what is called Self. That’s not true. The concept ‘infinity’ does not refer to anything based on direct experience (when do you ever directly experience something infinite?). All experiences are of a finite nature and no matter how many finite experiences you add up you are still no closer to ‘infinity’. You experience space and distance in your direct experience. You can then form a concept about ‘infinity’ by projecting what you perceive (distance and space) in all directions with no end. Of course you can’t experience infinity. I think what the author would point out is that you do experience space and distance, so necessarily you can make the leap and imagine through concept what infinity would be like by expanding it all without end. No, you don’t experience infinity. That’s absurd. And you cannot acquire the idea of infinity from conceptual negation of the finite because the idea of finitude presupposes the idea of infinity. The very meaning of ‘finite’ necessarily implies ‘not infinite’. Finite and infinite are two sides of the same coin. If you have one side of the coin then you necessarily have the other side as well. The purpose of this thread is to inquire into where the coin came from. Furthermore, the suggestion that we acquire any concept by a process of negation is nonsensical. Do you arrive at your idea of a circle from the conceptual negation of a non-circle? Or your idea of dog from the conceptual negation of non-dog? And what about the negation operator itself? How did you acquire that concept? By negation? lol! Now that I read this article over, it’s chalk full of mistakes. Concept acquisition via “abstraction” (whatever that means) is largely an illusion. Take the concept three as an example. The very recognition that a collection of elephants, apples, and oranges have “threeness” in common *presupposes possession of the concept three*. Unless you already possess number concepts then no such recognition can ever take place. So much for abstraction. Empiricism is nonsensical in the domain of concept acquisition. I’d suggest taking a look at innatism. False. You don’t “create” anything at all, and that includes concepts. Concepts are fundamentally no different from any other object of perception. You are falling for the following illusion of empiricism: Concept A is correlated with sense experience B, therefore, B must cause/be the source of A. But this is false since it confuses correlation and causation. …and that’s precisely why your explanation begs the question. If finite and infinite necessarily imply one another then you cannot invoke the former to explain the origin of the latter. You do not acquire the concept of circle from negation of non-circle. You do not acquire the concept God from negation of non-God. You do not acquire the concept red from negation of non-red. … and so on. And similarly, you do not acquire the concept infinity from negation of finite. If the concept of infinity cannot be acquired directly from sense-experience, abstracted from other concepts acquired directly from sense-experience, or acquired by a process of negation, then your claims are false. Yes, that’s what I’m seriously suggesting. The concept of infinity cannot possibly be acquired in the manner you’re suggesting because conceiving of absolute limits implicitly presupposes the idea of infinity. And if you presuppose infinity from the very outset then it shouldn’t be surprising that you have it in the end as well. Is this too difficult for you to grasp? Are you actually capable of putting forth a substantial counterargument or are you just going to continue arguing from assertion and personal incredulity? You’re making my very point for me. You cannot negate finite without first conceiving of infinity, just like you cannot negate a circle without first conceiving of a circle. Again, too difficult for you? If finite and infinite necessarily imply one another then possession of one concept necessarily implies possession of the other. Hence why any attempt to account for infinity as a negation of the finite is question-begging. Perhaps I’m not clarifying the problem well enough. The problem at hand is the following: How is it possible to conceive of infinity in the first place? And your response is essentially “because you can conceive of infinity”, which is viciously circular. The main point to take home from this counterexample is this: Conceptual thought is completely independent of the experienced world. The former is not at all dependent on the latter, as this poorly argued article suggests. … and I have no idea what paragraphs 3 through 6 have to do with the topic of concept acquisition. I’m only interested in discussing philosophy here. I have no interest in your personal psycho-babble/ad hominens/personal rants, etc. I cannot make sense of your word salads. Do you actually have thoughtful arguments/reasons/examples to support your claims or are you just going to continue playing internet psychologist/spiritual guru and baldly assert the same unjustified conclusions even after being presented valid evidence against such conclusions? If so, then I’m going to have to exit this discussion because I have better things to do with my time. You’re being quite stubborn. I just gave you one valid counterexample to this claim that “all concepts derive from sense-experience” but you continue clinging this completely unsupported belief. Do you have anything in your intellectual arsenal except dogmatic assertions? 1. Provides examples of concepts and propositional judgments that cannot be derived from the senses. 2. Explains why the cannot be derived from the senses. Hi Goran, I found you a few years ago via the Jed site. This essay series helped me realise that my unquestionable reality may actually be illusions. Anyway, I recently came across Donald Hoffman’s interface theory of perception and wanted to mention it to you as it fits very well with these essays and your book. He has some interesting videos you may find worth watching. Thank you, Sally.